We set off around midday down to Dunedin and tweedy had kindly volunteered to drive first, so the rest of us pretty much fell asleep straight away! The great thing about NZ is that there only really seems to be one road that gets you to each place, so you don’t really need to worry about directions or getting lost! Mobs had gone in Petes car so he wasn’t by himself which meant that Karen and I could stretch out in the back! 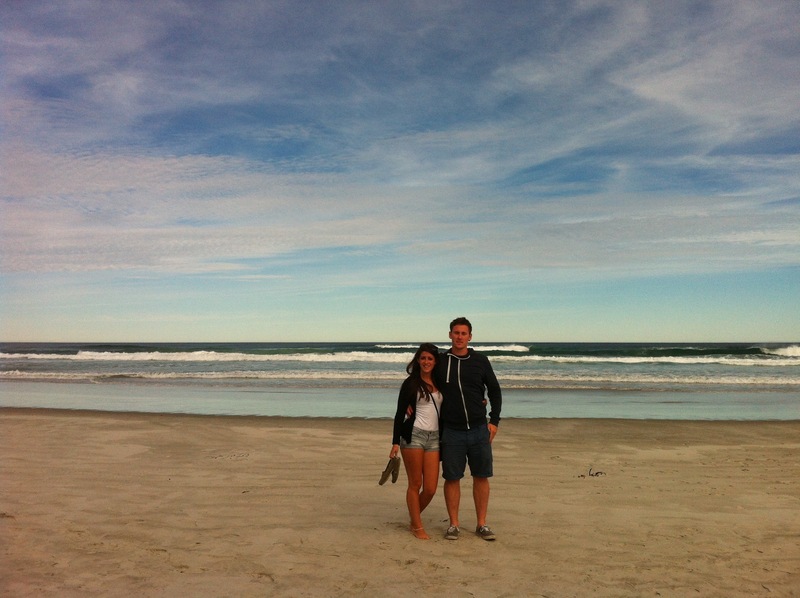 We arrived into Dunedin early afternoon and headed straight for our accommodation. As it was Easter weekend EVERYTHING was fully booked so luckily we had managed to find a hotel/apartment style place that had 2 double rooms left. This meant that we somehow had to try and sneak the other 2 in. Luckily, as it was Easter weekend, the receptionist left at 4pm so by the time we had checked in and lugged in all the bags she was gone! We got settled and tweedy and charlie had spotted a nandos on the way in so we went and had dinner there. Once we were done an had made contact with the other girls we got ready for the rugby! 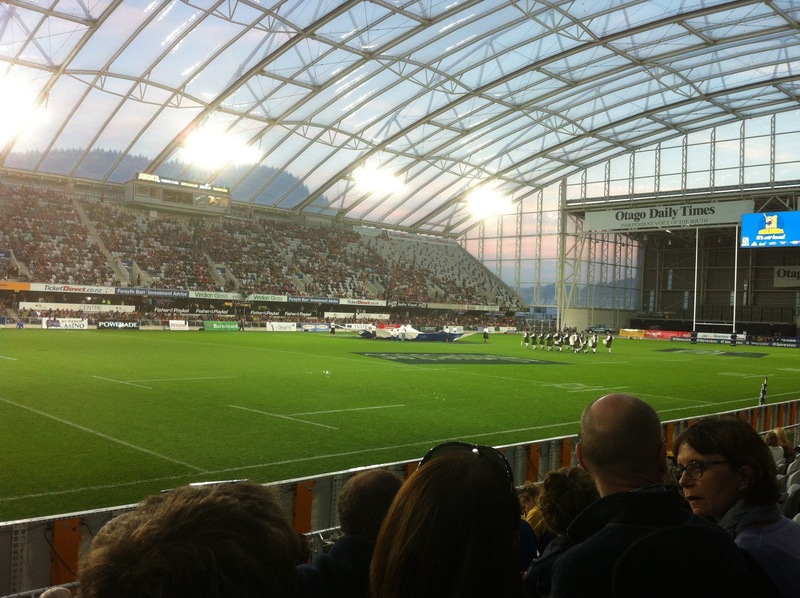 Dunedin is a huge student town and the rugby there is always a massive event so we had pre booked tickets. Sadly it wasn’t an international match but we were excited all the same. We met the other girls and followed the crowd to the match. We were watching the highlanders, which were the local team, against the reds, which were an Aussie team. As it didn’t make a difference to us who won we decided to support the locals, as according to mobs they were due a win soon! The match was so much fun, even though the highlanders lost. It was defiantly a highlight of our trip. Once the game was done we headed to the octagon in town as this was supposedly where everyone goes out. Again because the stupid Easter weekend rule everything had to shut at midnight. So we had a couple of drinks in one of the bars before heading over to where Ella, Sophie and rosy were saying. The downstairs part of there hostel was a huge snooker hall, so we went there and carried on drinking whilst attempting to play! After a variety of different matches we headed home, once again stopping at McDonald’s on the way! 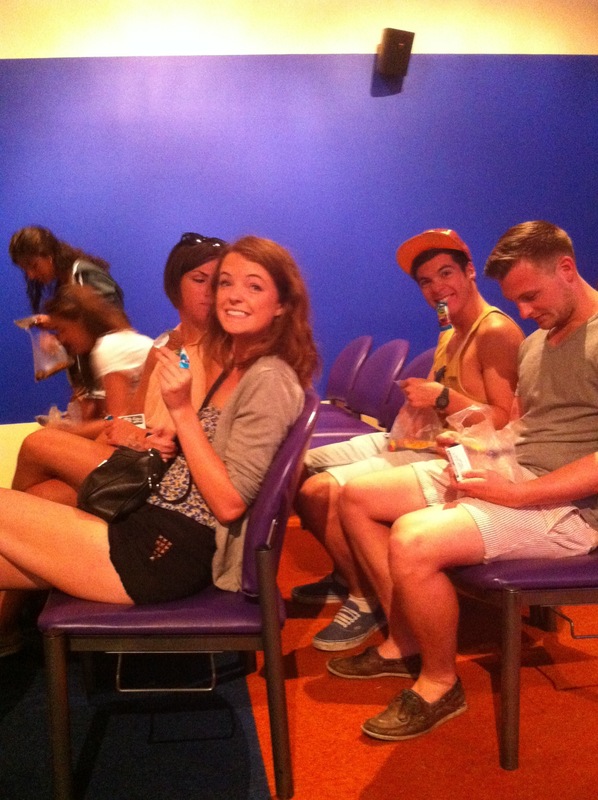 The next day we had a bit of a liein and the others got nandos for lunch! 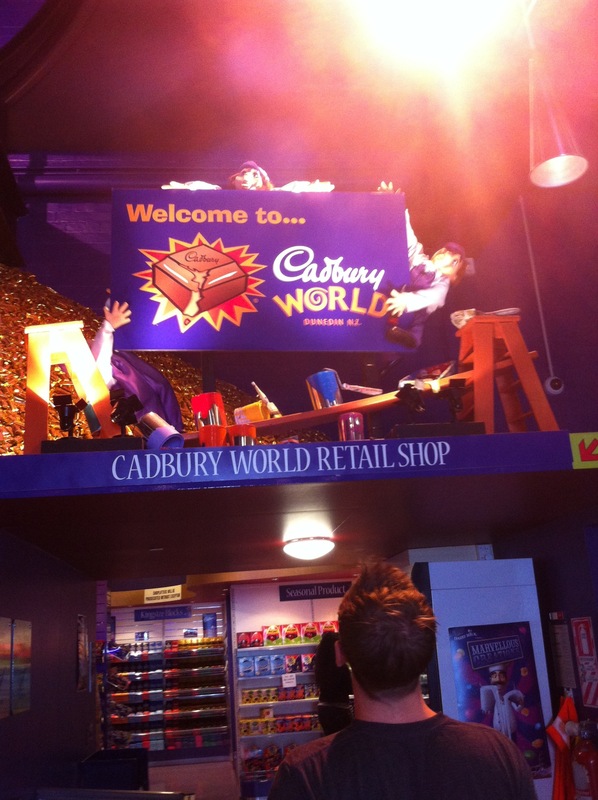 Then we went over to Cadburys world, something mobs and I had been looking forward too since we decided to go to Dunedin! Ella, Sophie and rosy were supposed to leave that morning on there bus but as they weren’t having the best time and Pete had a practically empty car they decided to stay with us instead! Because it was the weekend the factory was closed but we were still able to go on a great tour. As soon as we went in we met our guide who was a crazy old NZ man who had spent a lot of time in the uk. We each got a goodie bag that had some on NZ most popular Cadburys treats in it. 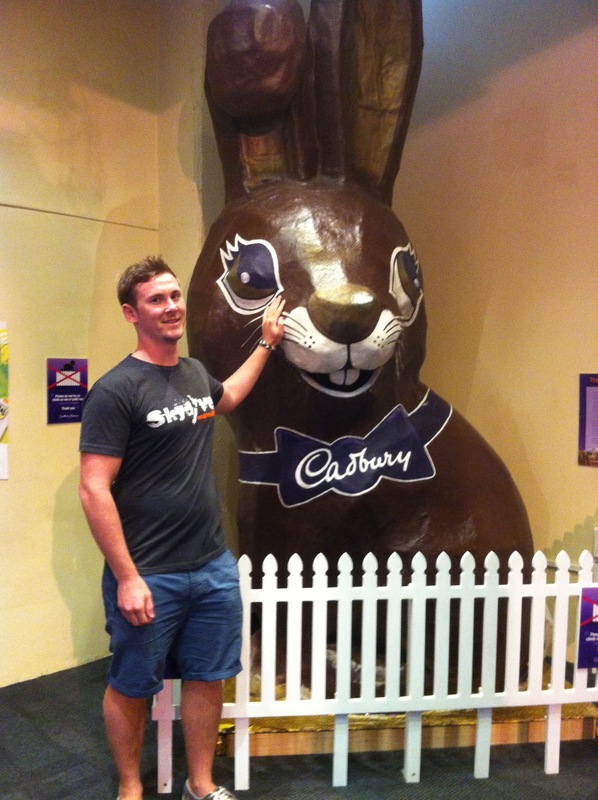 The chocolate in NZ is very different to the uk, I think it has something to do with the milk or sugar, but ours is way better! They also love marshmallows in NZ and lots of the Cadburys chocolate bars have marshmallows in them, which seemed very bizarre to us! 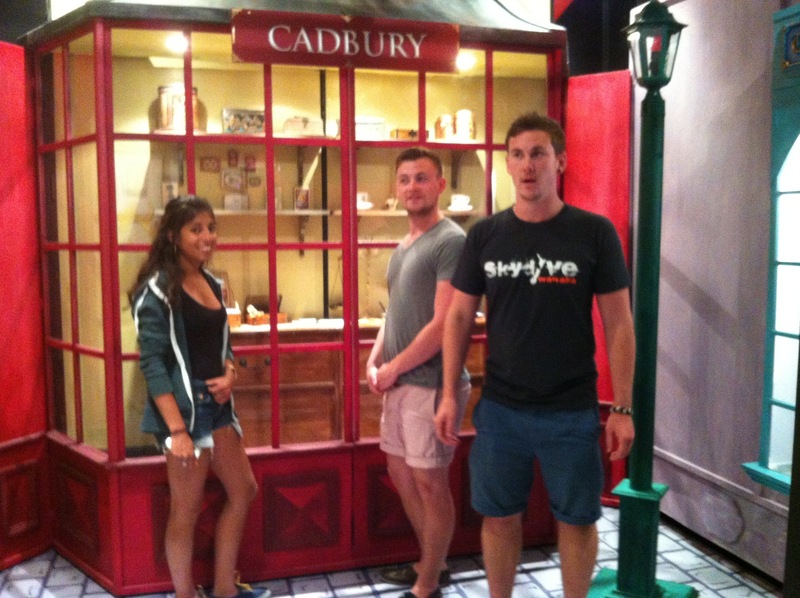 We watched a short video about the tour and this history of Cadburys in NZ and then we set off. We started outside looking at 2 old Cadburys delivery trucks which supposedly still work! The whole way round our guide was asking us questions and who ever gave the right answer got more chocolate! Next we watched another short video about how they make jaffas. Jaffas are not Jaffa cakes like I thought! 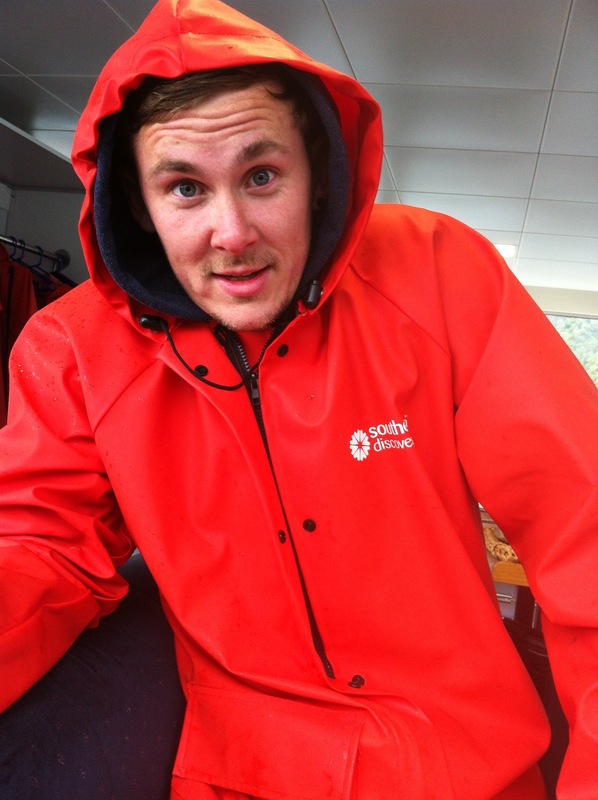 They are a NZ thing, they are similar to a smartie but more circular and are only orange. Next we started to climb one of the Cadbury towers. 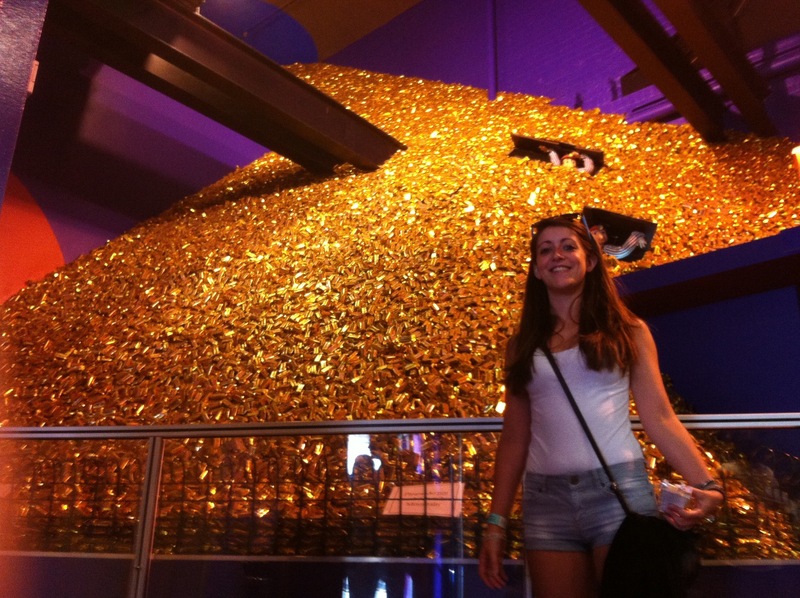 The walls inside the tower were covered with old chocolate and all you could smell was chocolate, it was my heaven! When we got to the top our guide pressed a button and suddenly there was a huge chocolate waterfall in front of us. It was awesome! When we came back out we were given samples of melted chocolate to try which were sooooooooo good! When our tour was done we all stocked up on cheap chocolate and Karen even tried the Cadburys chocolate cola, it wasn’t very nice! When we were done we went back and got the cars and went on a hunt to try and find some penguins and seals. After driving round for a while we eventually found the seal beach. We starts strolling up the beach when we saw a family walking the opposite way to us, we asked if they had seen any seals but they said no, there weren’t any. We carried on down the beach anyway. 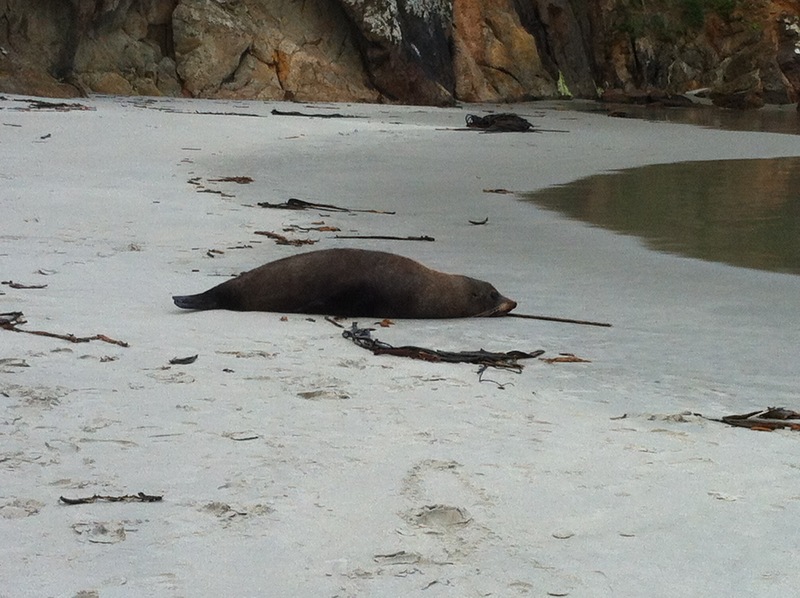 When we got to the very end of the beach, we were about to turn around and come back when luckily rosy looked round a huge rock and found 2 massive sleeping sea lions! We were all so amazed that we had found them and that we were so close to them! 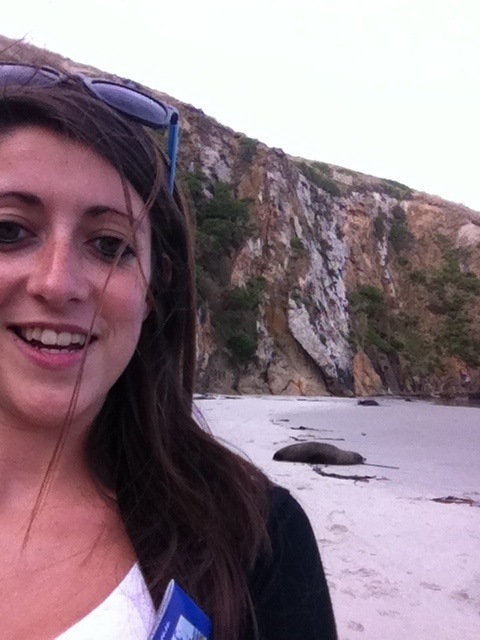 We all started taking pictures when one of the sea lions woke up, and wasn’t very happy about us being there. The good thing about sea lions is that when they are on land they are very slow and there isnt much they can do but growl at you and try to charge. We quickly got the hint and started to back away. We headed back to the cars, amazed by what we had seen and set off for penguin beach. After a short drive we were there but the car park for the beach was miles away on top of a really high cliff, so getting down to the beach would take about half an hour. We decided against it and instead headed back to where the girls were staying for a big group dinner, mainly cooked by Ella. Once we’d eaten we played more pool and then headed back to our place to watch movies. The next morning we were up super early to start the drive to Milford sound. It was my turn to drive so after we packed everything in we were off. Luckily the day before charlie had brought an aux cable so that we could listen to music through the stereo as you get no radio reception at all! I drove for a few hours along pretty much the same round until we stopped for lunch. Then charlie an I switched and he drove most of the rest of the way to Milford. We made it just in time for our cruse after mobs tried to collect what he thought was fresh spring water, turned out to have stuff floating in it and no one drank it! 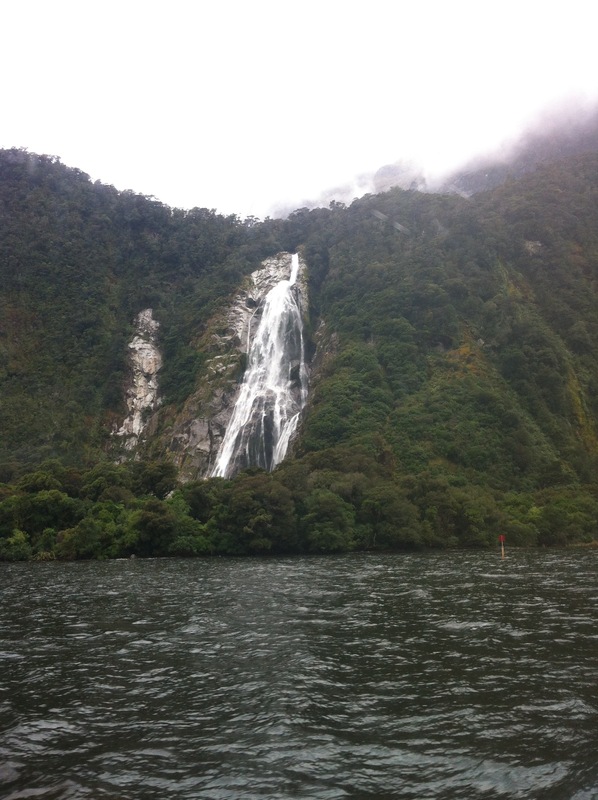 The cruse was amazing and Milford sound was so beautiful. It rained while we were there, but that’s very common, and in actual fact makes it more beautiful as the waterfalls are stronger. We saw tones of waterfalls and even a colony of seas which was really cool. As bloody usual I started feeling sea sick so had to sit inside for most of it, but I still had a great view. On the way back it was Karen’s turn to drive. I love you Karen, but I have never been so scared in my life!! The roads are very windy down through Milford and I spent most of the journey clutching Charlie’s hand!! We got to we’re we we’re staying pretty late and as we had to be up early, decided to have a chilled one. We made dinner and played cards and who am I until we all called it a night. The cars had too be back by 10am so we left at about 7 to make sure we had enough time. We arrived back in queens town with loads of time to spare, so we dropped all our stuff at our hostels and got some breakfast from the furg bakery. It wasn’t until Pete and the girls arrived that we heard how terrible there morning had been. Ella had left her phone at the hostel and on the drive back had got a speeding ticket. Everyone was pretty tired from our long weekend do we all went and napped. That evening was charlie and I’s last night in queens town so I thought it would be a nice idea if we went and had a nice meal, just the two of us. So charlie made a reservation at captains. We went down and had possibly one of the best meals I’ve ever had! To start we had muscles, then for main I had there award winning lamb (it was unreal!) 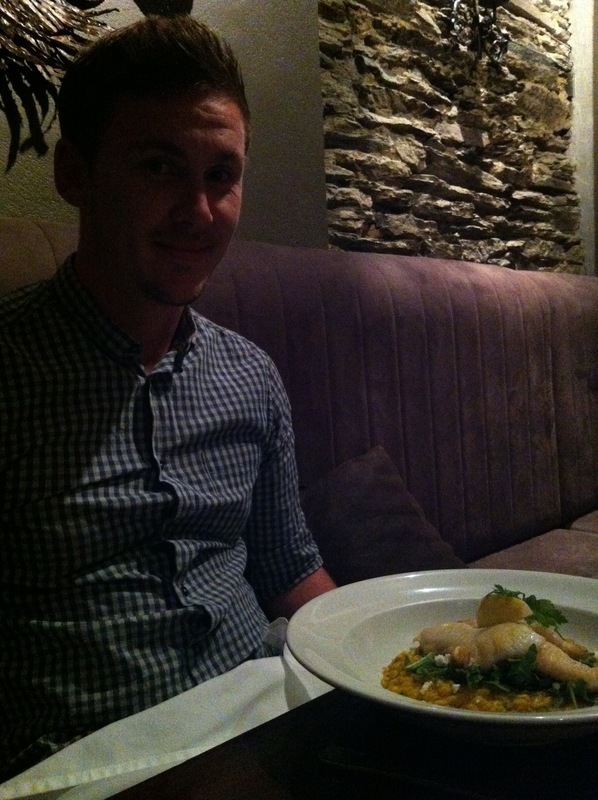 and charlie and the fish special, and for pudding we had a white chocolate cheese cake, again unbelievable. I would 100% recommend it to anyone even near queens town, it was that good! When we were done we went to meet the others at base to start pre drinking. When we checked into our room in nomads we also bumped into our old friend dustin so he came along too! 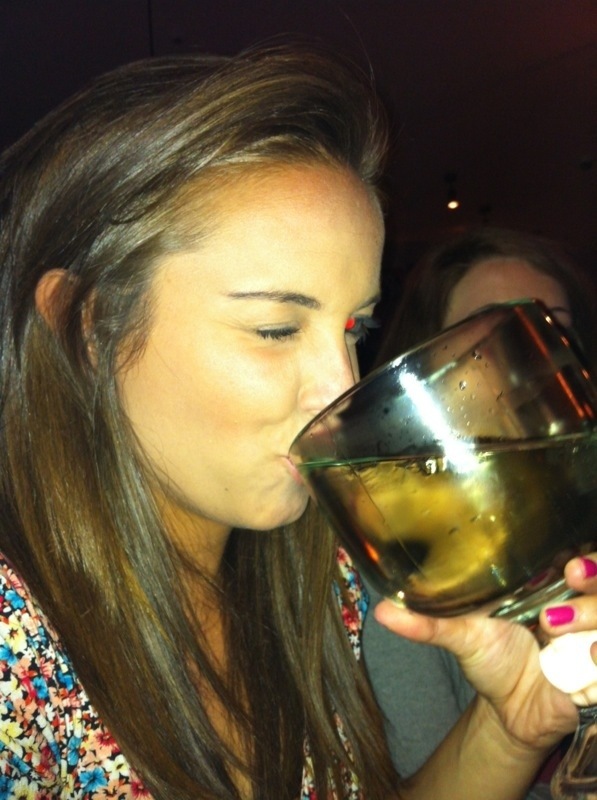 After a while we headed down to the fat badger for goblets of beer! Milsey also came down to see us so we had a great group. Tweedy and Sophie weren’t feeling too well so they headed back after fat badgers while the rest of us web up to world bar AGAIN! 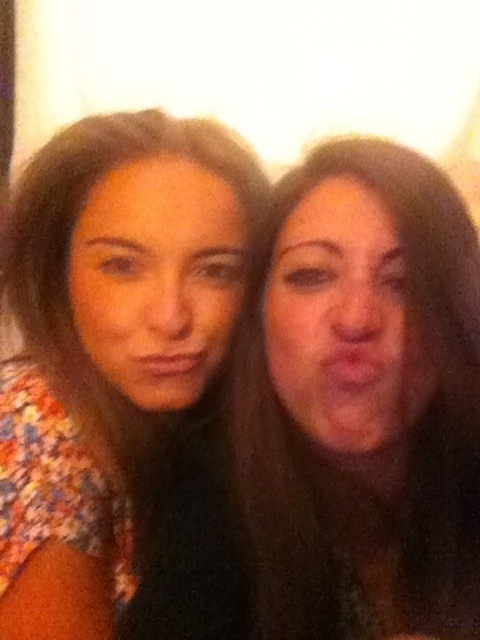 Not long after we got in rosy was a tad too drunk so Ella took her home. The rest of the night is a bit of a blur as we ended up getting very drunk. All I remember is that we ended up getting yet ANOTHER furg burger before calling it a night at god knows what time! The next morning charlie, dustin and I started the long arsed journey from queens town to Christchurch. All I’m going to say is it took 8hours and I was hung over. Not a good combo!